At the outset I wish to express my congratulations on the election of our President of the General Assembly at its 60 th session. You may rest assured of full support and co-operation of the Ukrainian delegation. Let me also pay tribute to your predecessor H.E. Mr. Jean Ping for his tireless efforts in the preparation of the World Summit. The World Summit 2005 has just come to its conclusion. Its Final Declaration provides us with clear guidelines. It is our common task to implement ambitious goals for building a safer and more prosperous world. Talking about implementation, I wish to emphasize two key elements, indispensable for the follow-up activity of the United Notions and, in fact, for a success of a global peace endeavour. They are credibility and democracy. Or rather – credibility based on democracy. We know that the way ahead is beset with serious threats and challenges. We have to make sure that the lack of unity may not belong to such challenges. Every nation likes to sing its own song. It takes our fundamental values and a lot of human wisdom to perform the role of a tuning fork in the global chorus of so many different voices. Credibility of the United Nations is indispensable to accomplish our missions in the new Millenium. Effectiveness, capacity, rapid response, financing development and all the rest of it will come along with credibility. UN Security Council reform is a vivid example of how difficult it is to accommodate the interests of 191 nations. It reminds me of a joke about distribution of committee posts in the Ukrainian parliament. They say that we should have 450 committees — that is the number of members of the parliament — in order to make everyone happy and feel important. Unfortunately we can not afford to apply a similar approach in the case of the Security Council, since its powers exceed by far those of any other UN body. The official position of Ukraine on the matter is clearly reflected in the statement of President Yuschenko during this Summit. Ukraine highly appreciates the job done by experts exploring various options of the Security Council reform. We may not abandon hope and should continue to seek consensus. Ukraine has fully supported the UN Secretary General's bold initiative to reform the organization and actively participated in this process. We re-iterate our support for the strengthening of the position of the Secretary General. In view of the forthcoming election of the Secretary General in 2006 we would like to remind the distinguished delegates that throughout the 60 year old history of the United Nations only the representatives of our Eastern European regional group has never occupied this highest post. Therefore, we believe that the Eastern European group has the priority in nominating its candidacy. Building this statement around the words "credibility" and "democracy", I cannot but stress the key function of our Organization, which is to maintain international peace and security. The memory of Rwanda, Srebrenica or quite recently Darfur should guide us to look for urgent remedies. One of them can become the "Responsibility to Protect" concept, which Ukraine fully endorses. We may not remain passive observers of genocide, crimes against humanity or gross and flagrant violations of human rights. Like it happened in 1932-1933, when Ukrainians experienced the Great Famine with devastating effects. The horrible memory of this man-made calamity lives today in every Ukrainian family, including my own. 20 000 innocent souls a day, half a million a month, ten million altogether were reaped by the death toll of Stalin's favourite ethnic policy. The Ukrainian government will never tire of making the international community abandon hypocrisy and finally recognize this act of genocide against the Ukrainian nation. It was therefore with much earnest and hope that Ukraine followed the deliberations on the new concept. Early warning, prevention and rapid response are key to ensure success and durability of our concerted actions. An expert combination of diplomatic, political and assistance tools has to suffice to avert future humanitarian disasters. Only should such measures fail to stop atrocities, the Security Council must be ready to act swiftly and resolutely, including the use of force, as the final resort. I would like to reiterate the position of Ukraine that apart from self-defense as provided in Article 51 of the United Nations Charter, only the Security Council may take legitimate decisions on the use of force. Peace and stability go hand in hand with human rights, the rule of law, freedom of the media. Credibility of governments rests on these fundamental values. We were all aware of malfunctions in the Commission on Human Rights. Poor mechanisms led to poor results. Credibility of the entire Organization was at stake. Therefore, Ukraine welcomes establishment of the Human Rights Council. We firmly believe that this important achievement of our Organization will be reflected in its further activity and not only in the change of the name. 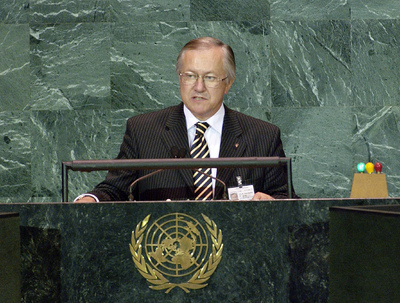 Likewise, Ukraine supports establishment of the United Nations Democracy Fund. Another matter of significance that should enhance credibility of the United Nations is the creation of the Peace Building Commission. It is evident that any conflict resolution needs a complex approach. The institutional gap between prevention, settlement and post-conflict rehabilitation has to finally be eliminated. To save your time at this late our, forgive me for not mentioning many areas of co-operation and many regions of the world that genuinely require our undiminished attention and actions. Be it non-proliferation, hot and frozen conflicts, AIDS, fight against poverty, Middle East or Iraq -- it is most often the issue of democracy of governance, or credibility of policies, or both. As concluding remarks, let me recall the phenomenon of the Orange Revolution in my country, for it was the quintessence of what our Organization stands for. It was not a one-time act. It is the process. It is not country specific, but part of the global heritage of democracy. An unselfish gift to all the nations striving for freedom around the globe.